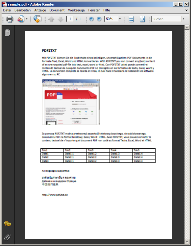 With PDF2TXT you can convert any (text) content of an unencrypted pdf-file into text, excel, word or html. The entire conversion will be online therefor no software installation is needed on your computer. Cannot read PIN? Click here! PDF2TXT.de is a online-service which enabels you to convert pdf files into html, excel and other files for free and without software installation.